October 14th 2012 started like most days when I’m on the road in America. I woke up in a low cost chain motel located in one of those endless suburbs, watched a bit of the Weather Channel (which must be my favourite American cable network channel) and drove to the nearest gas station where I got myself a tea and some muffins. It was a bright and sunny but also crisp and cold morning and I was ready to clock up some more miles. Standard. Except for the fact that it was about to be a very special day for me. The day before I’d had a great time in Manhattan and now I was leaving the NYC metropolitan area and heading towards Rhode Island – the last of the lower 48 states that I had yet to visit. But more about that a bit later. I left the strangely named Parsippany in New Jersey and headed north. That way I avoided travelling via busy NYC (which can be a nightmare) but also gave myself a chance to see the famous Hudson River Valley. I got lost a bit while trying to avoid some toll roads but finally made my way to the Bear Mountain State Park located just on the banks of the Hudson River. 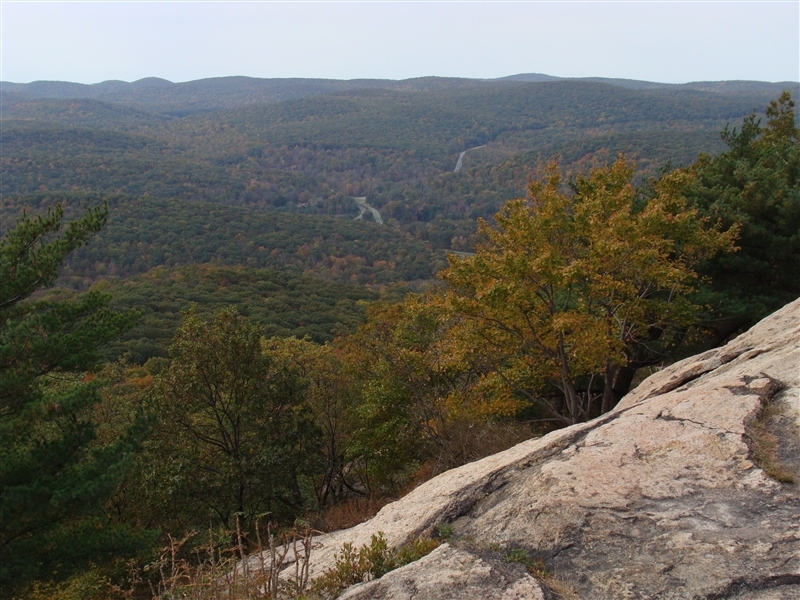 It is hard to believe that this beautiful and wild spot is located only about 50 miles from the heart of the Big Apple. Well, I said wild but, this being America, one can still drive all the way to the top of the 391 metres tall Bear Mountain itself. There is a viewing tower and, on a clear day, the NYC skyscrapers are visible on the horizon. At the time I got there it was a bit hazy but I could still just about to see them. Also clearly visible from the top is the majestic Hudson River Valley which is actually an estuary rather than a river, but let’s not be too picky about the terminology. The views are particularly spectacular during the autumn when heavily forested hills in the region are ablaze with colours. 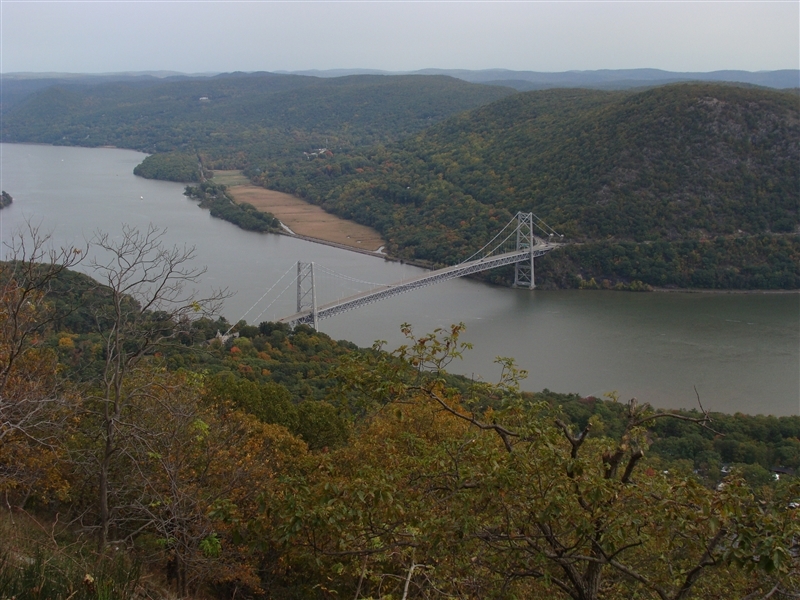 I crossed the Hudson via an impressive suspension bridge (also clearly visible from the mountain) and started heading towards the Atlantic. Being a road geek I couldn’t skip the chance of driving some bits of the Taconic State Parkway. 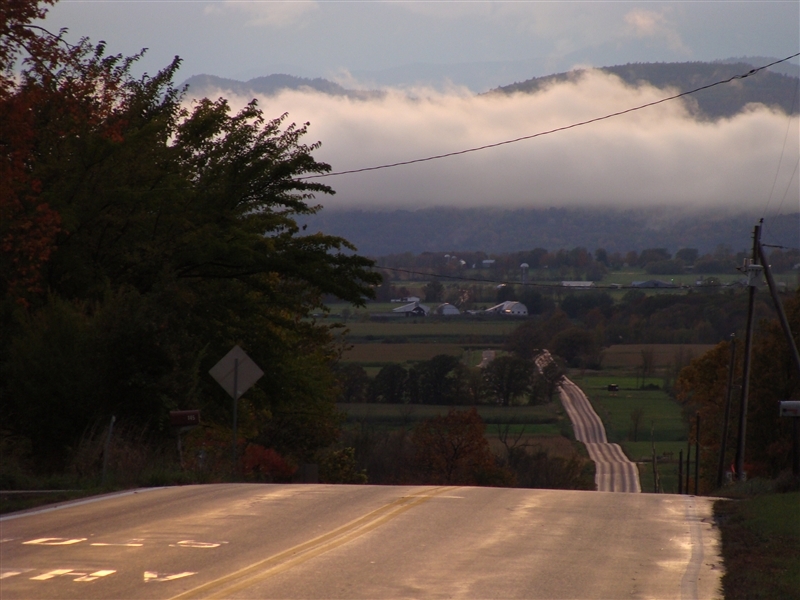 This great highway was in fact designed by a landscape architect rather than the usual road engineer and it offers some great vistas. No surprise then that the road itself and all the structures are actually listed on the National Register of Historic Places, one of the longest roads with such recognition. But let me not get carried away with all the road stuff. By early afternoon I was driving across the suburban mess of Connecticut, thinking more and more about Rhode Island when, somewhere east of New Haven, I spotted the first sign announcing the SSN Nautilus and Submarine Force Museum. What? It sounded way too cool to be skipped so, as instructed on this initial sign, I followed more signs leading to the U.S. Sub Base in Groton (don’t worry the museum is actually outside the base so no need to go through the security). I have to say that this sort of unexpected and unplanned stops are often some of the best experiences during my travels (like for example the Idaho Potato Museum) and the submarine museum was no exception. They have a real decommissioned nuclear submarine which you can enter and explore. And it is not some random sub but the world’s first nuclear powered submarine, the USS Nautilus (SSN-571), which is also the first vessel to complete a submerged transit of the North Pole on 3rd August 1958. A real piece of history and of technological achievement. What was really surprising for me was the size of it, way smaller than I expected from something powered by a nuclear reactor. Another surprise was how ancient it looked on the inside, with all the manual switches and valves cramped into the small quarters. In the modern era of touch-screens and fast computers it really requires a leap of imagination to picture this thing going underwater in a controlled manner. Apart from the Nautilus there are a few displays about the history of submarines as well as some hand-on exhibits for kids and adults. One of the best of them is a room where you can use the real working periscopes to look outside the museum building. You can for example look at your own car on the parking lot in the cross-hairs of the periscope and imagine sending torpedo into it. Pure fun. From Groton I followed the interstate 95 northbound and finally, about 5:45pm, crossed the Rhode Island border. So, that was it, after just over 11 years since my first trip to the US I was finally visiting the last of the lower 48 states. Here I have to say that Rhode Island is not a particularly exciting place. I’m sure there are some nice corners but for me it was all about completing the journey which started years earlier. When I went to America for the first time, in 2001, I could have never predicted how this trip was going to change my life. I was just yet another student who simply got a summer job in the states. It was a great summer and I had lots of fun in Disney World, where I worked, but it was the transcontinental drive afterwards, which I enjoyed with a group of friends, that really hooked me up into America. I just loved the long highways and the general feeling of being constantly on the move. As soon as I was on the plane back to Europe I just knew that I’d be back in the US. It was probably one of the main reasons why I started my PhD studies, so I could get a student visa again. Which I did and then spent another great summer across the pond, this time on the west coast. And yet again I felt I wanted to come back for more. It was probably America as well which was, at least partially, responsible for me dropping out of the PhD and heading to start a new life in the UK. I just knew that living in London would offer more possibilities for transatlantic travel than staying in Poland. And that is precisely what has happened. I went to the US again and again until I finally realised, a few years ago, that I had actually visited most of the states. It was only natural that my geographically-obsessed mind then became really fixated on the idea of visiting them all. This brings us back to the sunny afternoon on the October 14th 2012 when I drove into Rhode Island which, as I mentioned above, was the last of the lower 48 states on my list (of course there are still Alaska and Hawaii left but they are separated from the rest of the US and have to wait for my finances to improve anyway). The moment wasn’t really spectacular, no bridge crossing or anything even mildly exciting, just the usual welcome sign to the state alongside another sign stating that wearing seatbelts is required by law in Rhode Island. A bit anticlimactic to say the least. I should have chosen some more spectacular state to be the last one, but Rhode Island was just one of those corners I had missed during all my previous journeys. I mean I drove through it once, but I have never stopped there before (here I have to specify that according to my unwritten rules by a visit to a state I mean stopping there for at least a few hours, simply driving through and a loo stop or two won’t count). I celebrated my achievement in a local motel by treating myself to my favourite chewy chocolate chip cookies and a cup of tea while watching the Sunday Night Football game of, one my favourites, Green Bay Packers against Houston Texans. That was a good night (Packers won). People ask me sometimes what I am going to do once I visit all the states. Will I start going for my holidays somewhere else? Somehow I feel that it won’t change much, even after I bag Alaska and Hawaii too. This entry was posted in Uncategorized and tagged Bear Mountain State Park, Connecticut, Groton, Hudson River Valley, Rhode Island, SSN-571, Taconic State Parkway, USS Nautilus on March 2, 2013 by admin.